WORCESTER Warriors’ Kiwi signing Michael Fatialofa has been pencilled in for a new year debut for his new charges after director of rugby Alan Solomons confirmed the international had gone under the knife. The Warriors chief said Fatialofa aggravated a knee injury playing for Auckland in the Mitre Cup and had undergone an operation in New Zealand in a bid to be 100 per cent fit for his new club. Speaking at a press conference yesterday (Tuesday), Solomons confirmed Fatialofa was likely to feature in Warriors’ European Challenge Cup campaign when it resumes in January. Solomons’ men tackle Harlequins under the Friday night lights in the Gallagher Premiership looking to bounce back from Saturday’s 28-13 reverse at Bath and the Warriors chief praised Friday’s opponents. “Paul Gustard is a very good coach. He’s had good experience with Saracens and England and they are well into their season now,” he said. “They have changed the emphasis in the way they approach the game and have had a good season to date. “Our set piece – the lineout in particular – didn’t function at Bath. We have analysed it and we believe we have sorted out the problems we had. “Rory Duncan has come up with some solutions and we are confident things will be fine going forward,” he added. Ted Hill made his debut for England in the 35-15 win over Japan at the weekend and Solomons was delighted for the 19-year-old. “Ted is a terrific young player and it’s understandable Eddie Jones would want to give him that opportunity. He will be better for the experience of working in the England camp and being involved in the match 23 against Japan,” Solomons said. 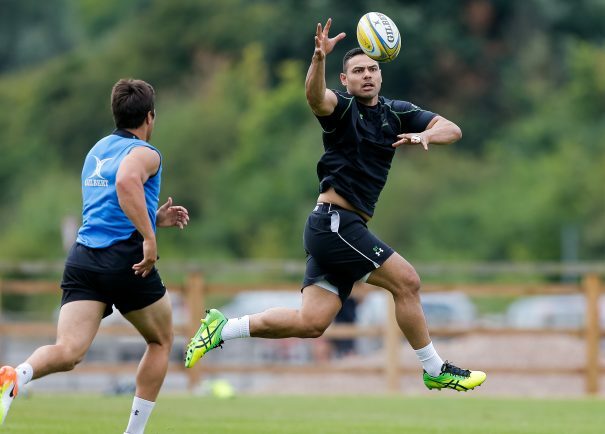 Fellow England man Ben Te’o also won praise from Solomons for his efforts, with the Warriors boss highlighting the benefits of Te’o as England prepare for next year’s Rugby World Cup. “He had only played 30 minutes of rugby for us this season before he went into the Tests but he is a big, powerful man and he suits what Eddie Jones wants,” he said. Solomons confirmed Ollie Lawrence would see a specialist today (Wednesday) to find out more about possible nerve damage in the leg he injured in the Premiership Rugby Cup match at Leicester. Alafoti Fa’osiliva has a calf injury and is not 100 per cent despite being a late call-up to the bench at Saracens, while Carl Kirwan should return in time for Warriors’ European excursions in the new year.